This chapter provides a comparative study of the “The Critic as Artist” and The Soul of Man to explore the connection between aesthetic consumption and self-education. It begins by examining Benjamin Jowett’s role in modernizing the Oxford Classical curriculum (known as Greats) and shaping the Indian Civil Service recruitment exam. It argues that Wilde’s critique of British Imperialism extends to Oxford and the model of leadership that was promoted through Greats. 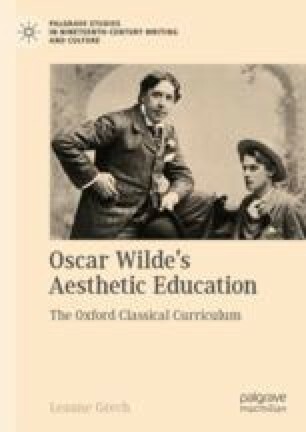 Wilde’s descriptions of Oxford also reflect on the conflict between professional work and the aesthete’s devotion to beauty. The process of contemplating and interpreting aesthetic literature creates an opportunity for people to pursue their intellectual interests outside of the university.